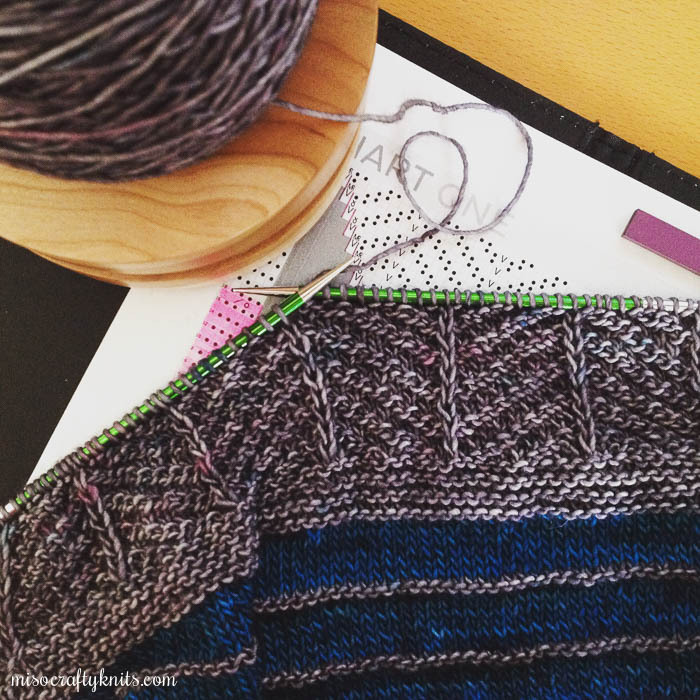 I realize that restricted knitting time and project monogamy equals to a lack of blogging fodder, hence why it's been pretty quiet here on the blog. My hands and wrists are doing a lot better than they have in months but I'm still not back to my usual knitty self. I can now knit for longer periods of time though, as long as I remember to take frequent breaks and get up and stretch for a bit every time. There have been a few times in which I totally forgot - and I blame this on podcast binges (true crime podcasts are my weakness!) - and then wind up having to take a break from knitting for the following two days. Sock knitting is still not on the agenda and has been something I've been testing out here and there. Some days my hands can handle the tiny needles and I try to make that moment last for as long as I can, which is usually no more than five minutes at a time. I'm not going to push it though. I'll definitely take those five minutes over not at all anytime! Sadly, the socks I've been working on before my RSI happened no longer fit the Munchkin. I thought I was knitting them a little bigger than what he was at the time so that there was room for growth, but obviously I didn't knit them big enough. So now I'm stuck as to whether I should just finish them as is and gift them or if I should just frog the sock and knit myself a pair. I asked the Munchkin what I should do and if he would be upset over not having a pair of "Mummy made" hand-knit socks. He insisted that he was ok with this...but I can make it up to him by knitting him a sweater. But not just any old sweater. A Cowichan-style sweater. My only response to that request so far has been: "we'll see". While I contemplate what I'm going to do about the socks, I'll keep plugging away on my Catkin shawl. This pattern has been quite enjoyable and I've worked on it enough now to be able to work on it with the Munchkin around and while the Mister chatters on about his day. I'm still on the first chart but can (finally!) see the end of that tunnel nearing soon, whereas last week it felt like I've been knitting for forever and a day and wasn't even close to being halfway through! I think the fact that all the rows are pattern rows is what makes me feel like a knitting slow poke. I was really hoping to have this finished in time to wear to the Munchkin's Parent Appreciation Tea event at his school but I highly doubt it considering that the tea is in three days and I have yet to even think about what kind of buttons would go with this pattern and my colour palette! In other news, I'm not able to do much in the sewing department either. My hands still protest at even the slightest idea of holding a rotary cutter. This truly bums me out. I miss sewing and had my heart set on sewing up something special for the kiddo's teachers when the school year is over. For the time being I've managed to re-open and slowly update my Etsy shop with a few "as is" sale items (and a few regular bags on sale just for fun). I have plenty more drawstring bags to list and have dedicated next week to taking photos of them. Yay!! As far as I know next week won't be as busy as it has been these past few weeks and so I hope to squeeze in more knitting and more posts. Is it wrong of me to wish for a rainy day this weekend so that I can stay inside and knit and not feel guilty about the kiddo being stuck indoors? progress might not be as quick as you'd like, but the yarn and the colours are so awesome, that every time I see it, I think it looks wonderful. A kid sized Cowichan sweater has fewer stitches than that shawl! And probably not that many more than a kids sized pair of socks, even. Does that make it less intimidating?